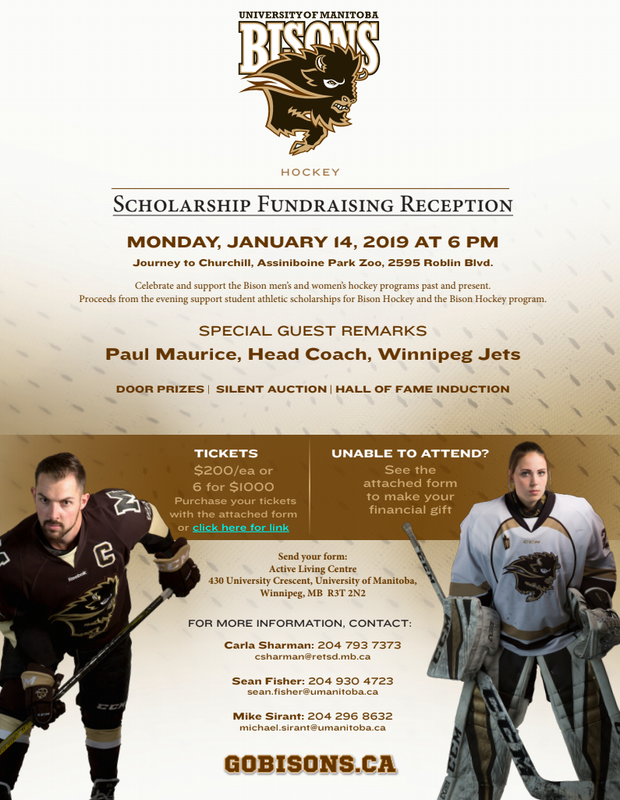 Ladies and gentlemen, if you're anywhere near the Winnipeg area on Monday, January 14 and are looking for an upscale event to attend, let me direct you to the University of Manitoba Bisons Hockey Scholarship Fundraising Reception being held at the Journey to Churchill location at Assiniboine Park Zoo. It promises to be an outstanding time with some great guests and some amazing prizes for those in attendance! Yes, I realize that the $200 price point for tickets is high, but this event is being limited to 150 people maximum. Because of this limited availability of tickets, the price is higher than one may expect, but there's also a good reason for that higher price. The grand prize at the event is a trip for two to Churchill, Manitoba to see the polar bears in their natural habitats which features airfare, hotel, and tundra buggy costs all being covered! The cost for this grand prize is estimated to be worth north of $5000, so it easily makes that $200 ticket worth the price of admission! The guest speaker is also a man whose time and knowledge of hockey is in demand as Winnipeg Jets head coach Paul Maurice will say a few words to the audience in attendance. There may even be a question-and-answer period based on how much time Paul's speech fills, so if you want to feel like a member of the Winnipeg sports media and toss a question at the coach, you have to be in attendance to do so! The only unfortunate part is that I've been asked to emcee the event. I know - bad decision by the Bisons on that one, but at least I get to dress up and look somewhat like I know what I'm doing even though we all know that's not true. But it is my hope that you'll come out and help the Bisons add a little cash to their hockey scholarship fund by joining myself, Paul Maurice, and the Bisons men's and women's hockey teams on Monday, January 14. Your attendance could allow a deserving young man or woman a chance to go to university, and that's the kind of opportunity every young man or woman deserves.